The Swan at Lavenham Hotel & Spa01787 247477work HotelSet in the heart of the beautiful Suffolk medieval village of Lavenham, the stunning 15th century Swan at Lavenham is steeped in centuries of history. With its half-timbered picture perfect exterior, luxurious surroundings, oak beamed interiors, open fires and cosy nooks, the hotel brings together a deep sense of history and occasion with a mix of classic and contemporary styling. The 45 individual bedrooms and suites have all the little luxuries you would expect from a four red star hotel; each room slightly different to the next. Guests can choose from a range of dining options to suit all moods and palates from simple, informal eating in the contemporary style Brasserie to sumptuous fine dining in the AA two rosette Gallery Restaurant. Tempting dishes are created by Head Chef Justin Kett, whilst Sommeliers are on hand to offer advice and suggest matching wines from the wine cellar. The Swan has a long-established reputation for its traditional afternoon teas with which it has enticed many a generation over the years. Now served in the Gallery Restaurant, the options include sweet or savoury Traditional Afternoon Tea, together with High Tea and you could of course include a glass of champagne. The relaxed Airmen's Bar is full of Second World War memorabilia and signatures from the airmen who were stationed at nearby RAF Lavenham (US Station 137), making it an inspiring setting to sit in front of the fire after a day out on cooler days. In warmer times you can also enjoy lunch, tea or cocktails in the sheltered gardens and hidden courtyard. Set in the heart of the beautiful Suffolk medieval village of Lavenham, the stunning 15th century Swan at Lavenham is steeped in centuries of history. With its half-timbered picture perfect exterior, luxurious surroundings, oak beamed interiors, open fires and cosy nooks, the hotel brings together a deep sense of history and occasion with a mix of classic and contemporary styling. In 2015, Weavers’ House Spa was opened at The Swan. Together with its ‘Good Spa Guide’ rating of 5 Bubbles, it is already an award winning spa and offers a fantastic place for you to relax. One of the most luxurious and intimate boutique spas in Suffolk, Weavers’ House Spa have first-class amenities to keep you serene and stress-free during your hotel stay or in-between treatments. Our spa facilities include: six treatment rooms, including one for couples, two relaxation suites, hot stone sauna, steam room, manicure and pedicure area, spa boutique, spa terrace and an outdoor vitality pool. Cycle storage available. 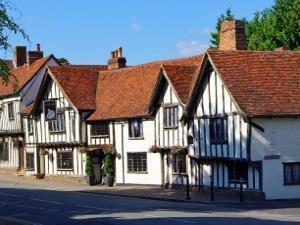 There are a number of art galleries and antique shops in and around Lavenham, together with places of historic interest. The National Trust’s Lavenham Guildhall is a 5 minute walk away from The Swan and the village was used as the backdrop for a Harry Potter film, together with appearing in a number of other films and TV programmes, including the 1980s series ‘Lovejoy’. Children welcome from any age. Follow signs for Bury St Edmunds on A14, take exit marked for Sudbury, as you near Sudbury, Lavenham will be signposted A1071.